•	Please read the rules in the bracket link. Any updates will be on the bracket link. •	Sign up as [player1name]/[player2name]. 3 different examples of how to register your teams are shown in the brackets. You may include a 3rd member of the team as a sub BUT the sub card can only be used once during the tournament and its effects are irreversible. PM 3rd player as sub to Nemesis before start of tournament to include. •	All team details must be confirmed 1 hour before the tournament starts. Check-ins begin 1 hour before start of tournament as well. Cool stuff I will check it out for sure. Hopefully Purelegacy isn't allowed to participate in it since he was caught hacking. Right? Once a cheater always a cheater.. ppl like him make sc2 dead. So hyped! It is just slightly an hour away! I hope that everyone can have a good time... I know of teams already plotting and strategizing and I believe that to be the fun part of the whole tournament. Reminder to check-in and if you have a sub/backup for your team to inform an admin or pm me via challonge etc. After 6 hours! 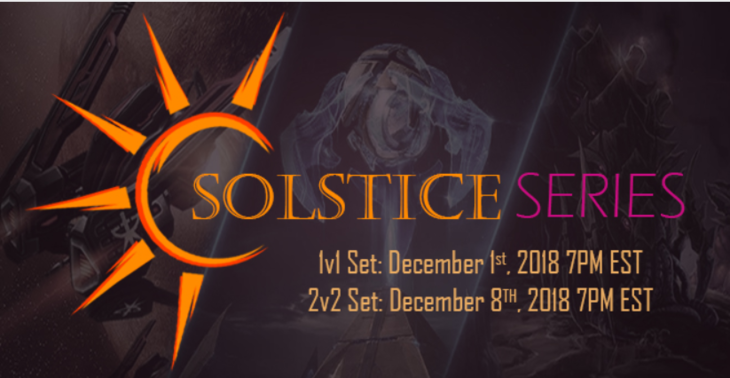 We have Nug/Night beating Infinity/Blademaster to clinch the top spot in the Solstice 2v2 tourney with [DuSt]Blask/santogrifo in 3rd place.